Google’s latest Nexus phone is finally here. 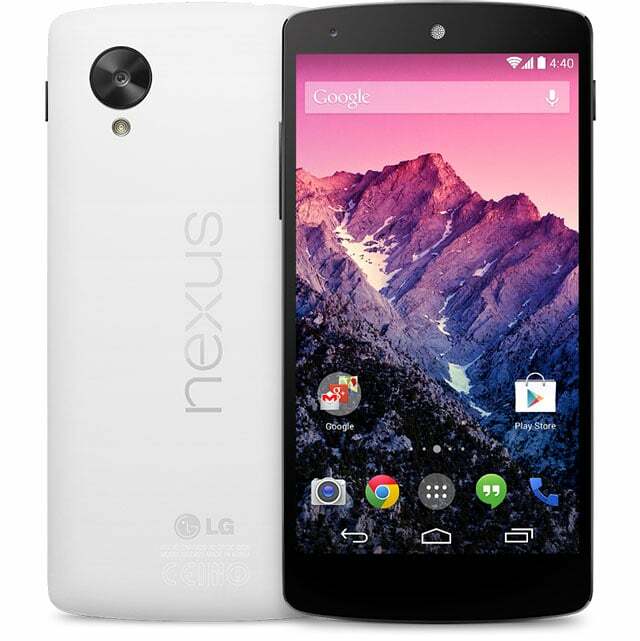 On Thursday Google announced the Nexus 5 manufactured by LG. The device is the first phone to come with the latest Android version, Android 4.4 KitKat. The Nexus 5 sports a Corning Gorilla Glass 3 5-inch display. In front of the device you’ll see a 1.3 MP camera and a 8MP rear camera with Optical Image Stabilization. The device runs on a 2.3GHz Qualcomm Snapdragon 800 processor and an Adreno 330 GPU. Like newer Android devices, the Nexus 5 has an NFC chip with Android Beam, Bluetooth 4.0 connectivity, and dual microphones. With its 2,300 mAH battery, Google claims the phone can last up to 17 hours talking, 300 hours on standby, 8.5 hours on WiFi, and up to 7 hours on LTE. The battery can be charged wireless. For $350, you can buy the 16 GB version of the Nexus 5 or 32 GB for $50 more. The phone will be available in black and white. Sprint, T-Mobile, and AT&T will carry the Nexus 5 in the coming weeks, it won’t be available to Verizon customers.